This blog is to share day to day programming problems that I face and their solutions I use. A lil bit unorthodox solution!! I faced this error (Report Server Model generation error: Table has a non-primary data source) yesterday while working on SSRS. I was trying to create a Report Model (SMDL) on SQL Server Buisness Development Studio and was getting this error repeatedly in final step of “Report Model Wizard”. I googled this error a bit but found no solution and hence I adopted this lil bit unorthodox option. 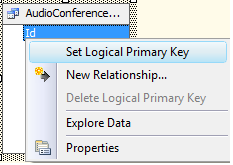 And then I used this new column as logical primary key, as shown in below image. This is working like charm for me but I am yet to test this fully so use this solution for you after through testing. Hope this helps. Fun, music, travel and nature loving, always smiling, computer addict! !